HIYAH HELLO fellow creative ninjas! Are you ready for some ninjarific art adventures? Creative ninja training BEGINS NOW with these activities. Come on, let's SHINOBI GO! Moby Shinobi #1 "Ninja on the Farm"
Moby Shinobi #2 "Ninja in the Kitchen"
Moby Shinobi #3 "Ninja at the Pet Shop"
Moby Shinobi #4 "Ninja at the Firehouse"
Grab your markers, crayons or colored pencils and bring Moby's Farm, Pizza Shop and Pet Shop adventures to life with your creativity and these coloring page adventures. Download the PDF by clicking this link. Moby had a wild time at the Pet Shop, and now his wheels of imagination or spinning like a hamster in a wheel! 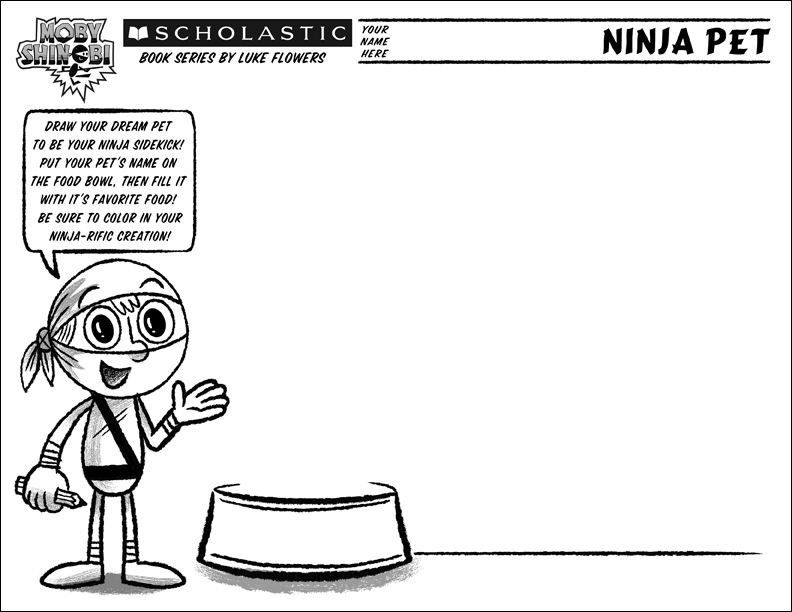 Can you help him create a Ninja Pet of your own to join him on his adventure! Name your pet, draw its favorite food and be sure to color it too. THEN Turn the page over and create a story for Moby and your pet! Download the PDF by clicking this link. 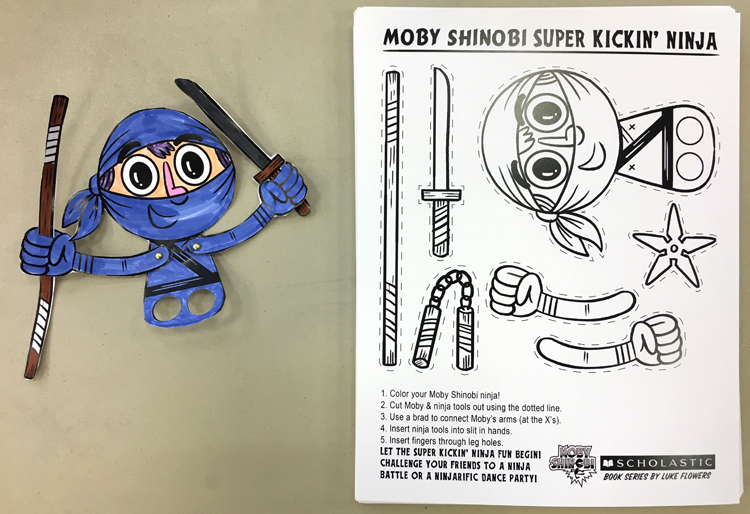 Join Moby in some kickin' ninja fun, with your own Moby Shinobi finger puppet! Color him in, cut him out and add on the accessories. Then the adventures begin — pose him for photos, make Moby movies, act out your favorite scenes from the books or have ninja battles with your friends! Download the PDF by clicking this link. Papa Peppy's Pizza presents, "The Peppy Palz"! 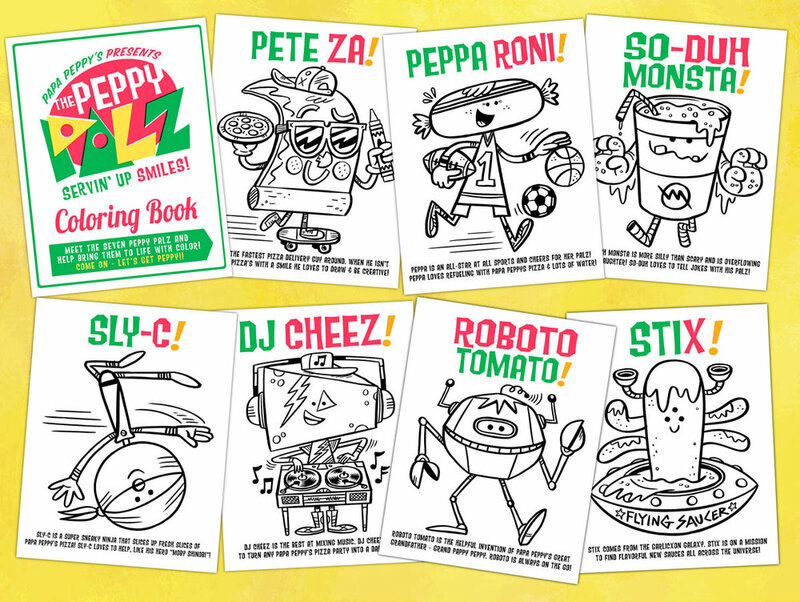 The Peppy Palz are a team of seven friends that work together to serve up smiles! You can meet the Palz and bring them to life by coloring each of them. Download the PDF by clicking this link. 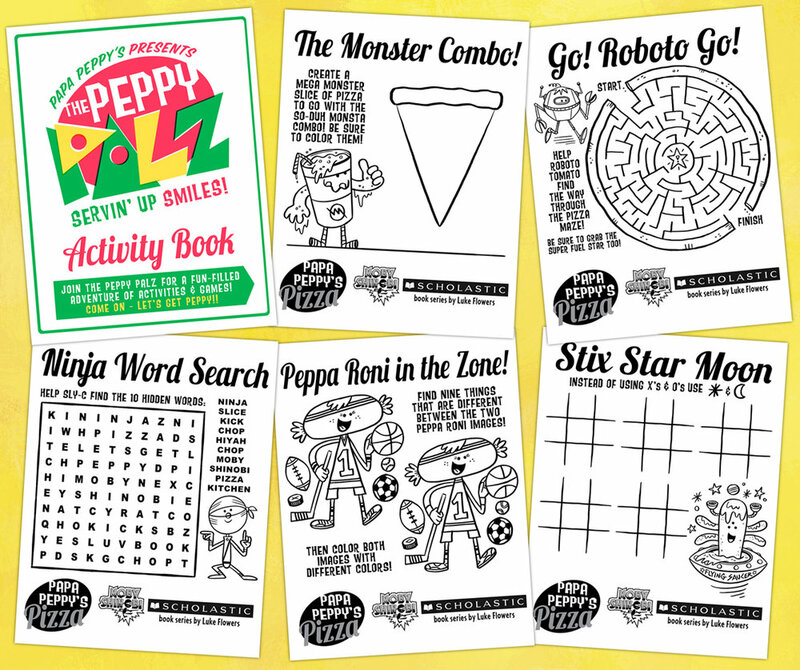 Now that you've gotten to know "The Peppy Palz", here are some fun activities they have ready for you to test your ninja activity game skills! Have fun, and don't forget to color the pages when you complete the games. Download the PDF by clicking this link. Papa Peppy is looking for new ideas for delicious pizza creations! He's also looking for a new super secret pizza sauce concept. You can let your imagination run wild - think of pizzas for monsters, robots, unicorns, cats, birds, and more. Or a silly pizza topped with your favorite candy! Then make up a pizza sauce to go with your pizza creation. Have fun with name and art for your sauce label. Be sure to color your creations and share it with your friends and family. Download the PDF by clicking this link. Now you can Moby Shinobi hanging out on your fridge, in your locker or any metal surface around your house! For even more fun - you can have ninja battles with your buddies! Print the Magnetic Moby PDF (includes 2 Magnetic Moby) and follow the instructions. Click this link to get the PDF file.